Limerick reached their first Allianz Hurling League Division 1 final since 2006 with this three points win over Dublin. This was a tight tense semi-final for long stretches at Nowlan Park but the All-Ireland champions ended their 13 year wait for a final spot with an impressive second half showing. Dublin did hit five of the last six scores but Limerick looked on course for next Sunday’s final when 1-18 to 0-12 ahead in the 62nd minute. The sides were level on seven occasions in a entertaining first half but it was Limerick that just edged ahead before the break to lead 0-10 to 0-09. Dublin had the backing of a breeze in the opening half and led for the first time in the 27th minute - 0-8 to 0-7 after a trio of frees from substitute Paul Ryan. The sides evenly shared eight points in the opening 11-minutes with Danny Sutcliffe and Eamonn Dillon helping themselves to two points each for Mattie Kenny’s Dubs. The Boys in Blue had an extra man back in defence but Limerick found early scores from play from Darragh O’Donovan, Aaron Gillane and captain Tom Morrissey. Graeme Mulcahy led the way for Limerick with three first half points and his side opened up the first two point lead mid-way through the half. But Ryan frees then had Dublin ahead. 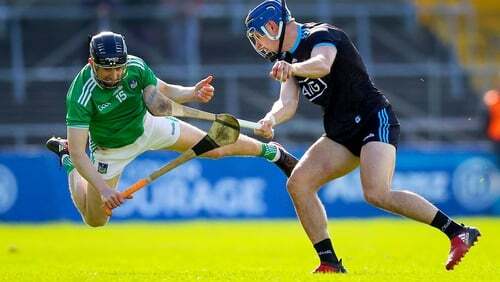 Points from Gearoid Hegarty and Gillane ended the half and had Limerick a point to the good after five minutes of injury time, much of it caused as Dublin players dropped like flies and Kenny was forced to make three substitutions before the interval. Despite 11 second half wides, Limerick were on top. Darragh O’Donovan was among their early second half scores but Dublin hit back and it was 0-13 to 0-12 after almost 15-minutes of action. Then came the Limerick break for the winning line. Peter Casey and Gillane and Byrnes points from frees moved the lead out to five points. That was before the all-important goal in the 61st minute - Seamus Flanagan finding the net just eight minutes after his introduction. When Diarmaid Byrnes added a score from play to his frees, Limerick were nine points clear with eight minutes to play. Dublin hit back, sub Ronan Hayes getting the goal, but John Kiely’s Limerick held on for the win and to end a run of three semi final defeats in a row. Subs: P Ryan (0-06, 6f) for O'Rourke, inj (11), T Connolly (0-01) for Gray, b-s (14-35), F Whitely for Sean Treacy, inj (20), J Malone for McBride (25), R Hayes (1-00) for Hetherton (42), David Treacy (0-01) for Boland (51mins).